Italian — Tolkien e la Grande Guerra: La soglia della Terra di Mezzo (Milan: Marietti, 2007). French — Tolkien et la Grande Guerre: Au Seuil de la Terre du Milieu (Paris: Christian Bourgois, 2014). German — Tolkien und der Erste Weltkrieg: Das Tor zu Mittelerde (Stuttgart: Klett-Cotta, 2014). Audiobook from Der Hörverlag. Spanish — Tolkien y la Gran Guerra: El Origen de la Tierra Media (Barcelona: Minotauro, 2014). Polish (brief excerpt) — Najstarsza wersja legendarium J.R.R. Tolkiena (‘The oldest version of Tolkien’s legendarium’), Aiglos 6 (Katowice: Śląski Klub Fantastyki, 2006). ‘Ilu’s Music: The Creation of Tolkien's Creation Myth’, my investigation of the original sources and inspirations for the opening story in The Silmarillion, in a collection on Tolkien and world-building, Sub-creating Arda (Zürich: Walking Tree, 2019) edited by Dimitra Fimi and Thomas Honegger. Preface to ‘Uncle Curro’: J.R.R. Tolkien’s Spanish Connection (Edinburgh: Luna Press, 2018), José Manuel Ferrández-Bru’s biography of Tolkien’s guardian and ‘second father’, Francis Morgan. Also in Spanish as ‘El Tio Curro’: La Conexión Española de J.R.R. Tolkien. A Brief Biography, in A Companion to J.R.R. Tolkien, edited by Stuart D. Lee (Oxford: Wiley-Blackwell, 2014), part of the Blackwell Companions to Literature and Culture series. Includes chapters by Tom Shippey, Verlyn Flieger, John D. Rateliff and other key figures in Tolkien scholarship. My opening chapter gives a detailed chronological overview of the life and work in 8,500 words, and is available as a downloadable excerpt at the Wiley website. The Undergraduate Tolkien, in Exeter College: The First 700 Years, ed. Frances Cairncross with Hannah Parham (London: Third Millennium, 2013) – a condensed and slightly revised form of my ‘Tolkien, Exeter College and the Great War’ (see below). J.R.R. Tolkien and the boy who didn’t believe in fairies uncovers the incident which first taught the young Tolkien that fairy-stories are not kids’ stuff. 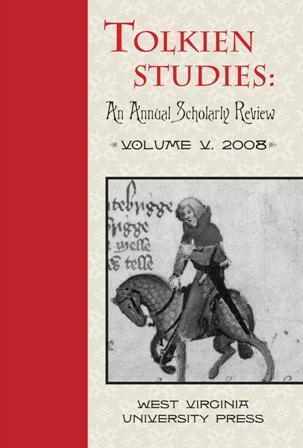 When it was published in Tolkien Studies 7 (WVUP 2010), veteran Tolkien scholar David Bratman said, ‘I have never read a scholarly paper that left me more thoroughly charmed.’ It was voted best article of 2013 in the inaugural Tolkien Society Awards after being published (with previously unseen photographs) on my website here. Also available in Spanish. Tolkien, Exeter College, and the Great War, in Tolkien’s The Lord of the Rings: Sources of Inspiration, ed. Stratford Caldecott and Thomas Honegger (Zurich: Walking Tree, 2008). Presented at the conference held at Exeter College, Oxford, 21 August 2006; cited in the Oxford English Dictionary. Now comprehensively revised, expanded and illustrated as a monograph, Tolkien at Exeter College: How an Oxford undergraduate created Middle-earth. ‘As under a green sea’: visions of war in the Dead Marshes, in The Ring Goes Ever On: Proceedings of the 2005 Tolkien Conference, ed. Sarah Wells (Tolkien Society, 2008), and (in slightly expanded form) in Myth and Magic: Art according to the Inklings, ed. Eduardo Segura and Thomas Honegger (Zürich: Walking Tree, 2007). Italian translation, as ‘Visioni di guerra nelle Paludi Morte’, in Tolkien: La Luce e l'Ombra, ed. Giovanni Agnoloni (Ascoli Piceno: Senzapatria Editore). J.R.R. Tolkien Encyclopedia: Scholarship and Critical Assessment, edited by Michael D.C. Drout (Routledge, November 2006): entries on Artists and Illustrators’ Influence on Tolkien, ‘English and Welsh’, R.Q. Gilson, Jennie Grove, Nazi Party, A Spring Harvest, the T.C.B.S., Francis Thompson, Christopher Wiseman and World War I. Now available in paperback and ebook, and at Routledge Literature Online via participating libraries and institutions. Frodo and the Great War, in The Lord of the Rings, 1954–2004: Scholarship in Honor of Richard E. Blackwelder, ed. Wayne G. Hammond and Christina Scull (Milwaukee: Marquette University Press, 2006). Presented at Marquette University, 2004. See here for one discussion of this paper. Revised version published as Volt egyszer egy földbe vájt lyuk – Tolkien és a lövészárkok in J.R.R. Tolkien: Fantázia és erköles, ed. Dr Pődör Dóra, Nagy Andrea and Füzessy Tamás (Budapest: Magyar Tolkien Társaság, 2012), the proceedings of the Hungarian Tolkien Society’s Budapest 2012 conference. Revised and abridged version published 14 December 2014 as Der wahre Krieg des Herrn der Ringe in Die Welt, based on my 2 November talk at Dresden’s Militär Historisches Museum. Tolkien e la Grande Guerra: ‘orrore animalesco’ nella Terra di Mezzo, in Mitopoiesi: Fantasia e storia in Tolkien, ed. F. Manni (Brescia: Grafo, April 2005). Expanded and translated version of ‘Tolkien and the Great War: “animal horror” in Middle-earth’, a conference paper presented in Brescia, Italy, 2004. J.R.R. Tolkien, The Fall of Gondolin, in The Times, 25 August 2018 (register here to read two free articles per week). ‘A once-in-a-generation event’ – I review the Bodleian Library exhibition Tolkien: Maker of Middle-Earth for the Sunday Telegraph, 2 June 2019. Interview with Oscar-winning artist Alan Lee about his work on Tolkien’s Beren and Lúthien, the Peter Jackson movies, and other highlights of his career, Telegraph Review section, 27 May 2017 (right). J.R.R. Tolkien, Beren and Lúthien, in the New Statesman, 26 May 2017. When JRR Tolkien bet CS Lewis: the wager that gave birth to The Lord of the Rings, Telegraph online (free registration required) on 8 December 2016 and as a double-page spread in the Sunday Telegraph (Living section) on 11 December. The article reveals for the first time the date Tolkien conceived his story of Númenor. J.R.R. Tolkien, The Lay of Aotrou and Itroun, Telegraph online (free registration required) on 16 November 2016 and in the newspaper’s Saturday Review on 12 November. A Secret Vice: Tolkien on Invented Languages, edited by Dimitra Fimi and Andrew Higgins, New Statesman, 15 April 2016. J.R.R. Tolkien, The Story of Kullervo, edited by Verlyn Flieger, in the Mail On Sunday, 6 September 2015. The birth of a legend, article on Tolkien at Exeter College for the college’s Exon magazine (pdf), 13 August 2015. Tolkien’s death of Smaug: American inspiration revealed, in the Guardian (9 December 2014) and South China Morning Post (20 December 2014). Der wahre Krieg des Herrn der Ringe (‘The real war of The Lord of the Rings’), in Die Welt, 14 December 2014 – an abridged text of my 2 November talk to a capacity crowd at the Militär Historisches Museum in Dresden. Tolkien and Oxford, article in German for TV magazine Arte, 28 November 2014. Birth of a new world: the Tolkien poem that marks the genesis of Middle-earth: I outline the results of a full-scale investigation I’ve written for Tolkien Studies 11. The Guardian, 24 September 2014. Why World War One Is at the heart of Lord of the Rings – for The Fellowship of the Ring’s 60th anniversary. Daily Beast, 29 July 2014. Also in Portuguese. Secrets of The Hydra: How my Tolkien research uncovered lost Wilfred Owen magazines: in Oxfordshire Limited Edition, 12 June 2014, and on my blog. Tolkien’s Beowulf: A Translation and Commentary, together with Sellic Spell: Review in the New Statesman, 30 May 2014, and preview feature in the Guardian, 22 March 2014. Battle of the Somme: the ‘animal horror’ that inspired JRR Tolkien, in the Sunday Telegraph’s First World War supplement, 6 October 2013. The magical books of Alan Garner, JRR Tolkien and other fantasy author, feature previewing the Bodleian Library’s summer exhibition Magical Books, in The Times, 8 June 2013 (subscribers only). Reproduced by Oxford Today as ‘The Magical Books of the Bodleian’ (open access). J.R.R. 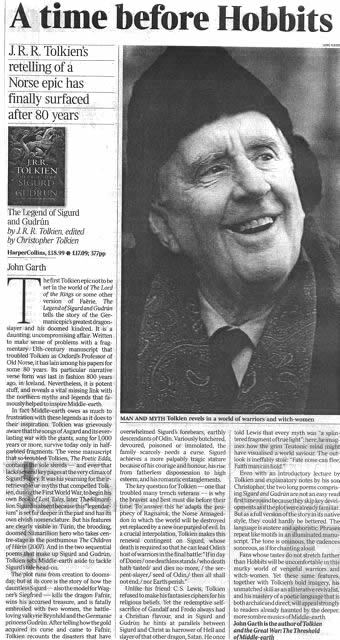 Tolkien, The Fall of Arthur, in The Daily Beast, 23 May 2013, ‘Tolkien’s unfinished epic’. My review is also available in French and Portuguese. Mark Atherton, There and Back Again: J.R.R. Tolkien and the origins of The Hobbit, Oxford Today, March 2013. — Also in Portuguese at the Tolkien Brasil website. T.A. Shippey, J.R.R. Tolkien: Author of the Century, in the Evening Standard, 27 November 2000, ‘Far too successful — can’t be any good’. — Reprinted in La Rivista, journal of Endóre (Italian Tolkien Society), issue 5 (September 2002). ‘How Tolkien discovered fairy-tale through Beowulf and war’, published at the launch of the Sci-Fi and Fantasy Network, 27 March 2015. Previously presented at‘Tolkien’s Beowulf: A Roundtable’, a Medieval English Research Seminar with the Faculty of English at Oxford University, 22 October 2014. Guest editorial, Mallorn 48, October 2009. J.R.R. Tolkien, Smith of Wootton Major, extended edition edited by Verlyn Flieger, 2005. This previously unpublished review can be read here. Several of these posts are also available in Portuguese via Tolkien Brasil. Tolkien’s “immortal four” meet for the last time (25 September 2015): A discovery in the archives marks the final gathering of the TCBS. Named Best Article in the Tolkien Society Awards 2016. Also available in Spanish. A friend of Tolkien’s TCBS tells a neglected truth of war (25 May 2015): The tragic fate of a Great War survivor. Dragon scale: Why it’s impossible to size up Tolkien’s Middle-earth (18 January 2015): I question attempts to treat the legendarium as if it were fact. Middle-earth turns 100 (24 September 2014): uncovers the evidence that Tolkien saw this date as the foundation of his legendarium. Tolkien at fifteen, a warrior-to-be (5 March 2014): the lowdown on a unique, newly discovered photograph of Tolkien with his school Cadet Corps. Sam Gamgee and Tolkien’s batmen (13 February 2014): the biographical and literary implications of a fascinating Tolkien letter up for auction. Tolkien, the Somme and scholarship (29 January 2014): report from an Oxford lecture on Tolkien’s battlefield verse-drama The ‘Homecoming of Beorhtnoth, Beorhthelm’s Son’. 100 years of Middle-earth (25 January 2014): how the undergraduate Tolkien limbered up for his career as a writer.